Shipping classes Define shipping costs per specific shipping classes individually. Shipping zones Setup rates per delivery areas defined by zip/postal codes, states and countries. Weight-based shipping Both progressive rates and flat rates table are supported. Free and flat rate shipping Offer a free or a flat rate delivery depending on order subtotal, destination or other attributes. International shipping Offer different shipping rates for international orders. Flat rate box shipping List boxes, envelopes, tubes or other packages you ship with and plugin will try to pack order items into them to determine shipping cost. Third-party plugins integration: DHL, FedEx, UPS, USPS and more Enable or disable other WooCommerce shipping plugins depending on various conditions supported by Tree Table Rate Shipping. Combine two or more shipping methods. Any destination WooCommerce supports is supported by the plugin too. Charge different costs depending on items shipping classes, tags and categories. Combine them in any way you need. Charge by order weight, volume or item count. Even by all these at the same time. Calculate shipping cost per item, product, shipping class, tag, category or for entire order. Include your expenses to the resulting shipping cost. Both flat and percentage fees are supported. Any combination of them is supported too. Offer multiple delivery options to your customers to choose from. Delivery options can be shown or hidden depending on a number of conditions, such as the order destination, weight, subtotal and others. If you are using another WooCommerce shipping plugin and want to activate or deactivate it under some circumstances, you can easily do this with the External Rates tool. It's useful to conditionally combine two or more existing shipping plugins such as FedEx, USPS, DHL or many others. 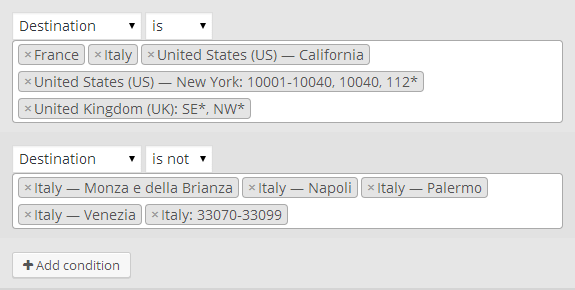 Unique plugin feature of nested rate tables makes it possible to define great variety of shipping configurations from simple to fine-grained and complex ones. Plugin can supersede many other shipping plugins. It can be even a replacement for multiple WooCommerce shipping methods at the same time. If are not satisfied with the plugin we will refund the full price. Just let us know in the next 14 days after purchase. Give it a try! Many custom shipping methods you had to develop for your e-commerce customers before, now can be implemented with the Table Rate Shipping instead, saving hours of development.